Sweetwater Fishing Expeditions is a fly fishing outfitting and guide service based in the Lander, Wyoming, specializing in guided camping trips into the grand and rugged Wind River Mountains and day fly fishing excursions on the smaller streams of the area and float trips on the Bighorn River. 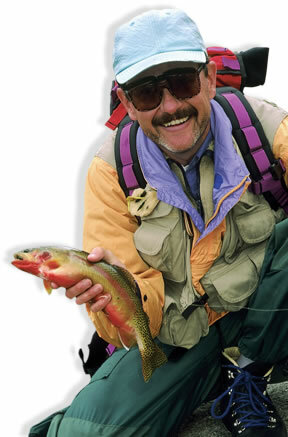 We are not only knowlegable fly fishermen, but also patient and professional instructors. We enjoy the natural environment and the histroy and geology of our West. We hope that you will partner with us and take the opportunity to learn from our expertise. We have beautiful and secluded areas to take you to, where you may feel you are the first person to leave your tracks there. Envisioned, owned, and operated by George, Paula, and Hank Hunker (since 1977), we are proud of our small family business, the many friends we have come to know through it, and how well we have been able to serve. Come join us for an experience of a lifetime! Hank Hunker produced this Wyoming video. Enjoy here. View his 2012 video here. Read the 2013 article about us in Field and Stream. Click here to read our latest newsletter, March 2018.